Conrad Seoul’s 37 Grill and Bar offers two choices of bingsu, the ultimate Korean summer dessert made with shaved ice and milk. Diners are offered a choice between mango and red bean for the topping. The milk is brewed with Althaus’ Earl Grey tea. 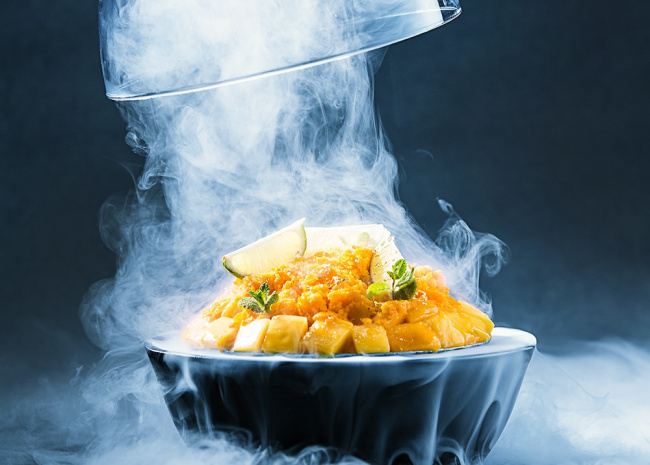 A special plating decoration is added with the use of dry-ice to create a cloud-like mirage. The ice-cold decoration also prevents bingsu from melting. The bingsu menus are offered until Sep. 16 at the price of 38,000 won for mango topping and 42,000 won for red bean topping. For more information or reservation, contact 37 Grill and Bar at (02) 6137-7110. 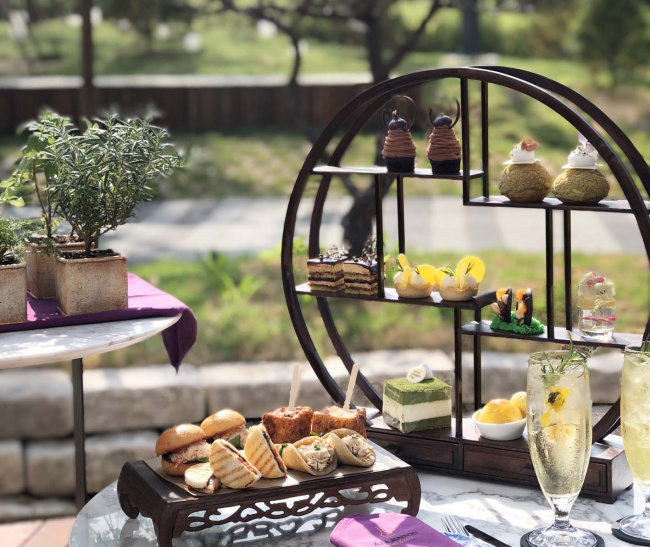 Seoul Dragon City’s wine bar A La Maison presents Maison de Garden Afternoon Tea Set. The overall theme is set around the idea of a secret garden in the city center, as the set menu can be ordered from the hotel’s newly opened garden terrace. The set includes two cups of herbal tea, four sandwiches and eight desserts, including champagne jelly and lemon tart. Diners can also smell six types of tea herbs before choosing what to drink. The tea set can be ordered from 11:30 a.m. to 5 p.m. Only 10 sets per day are available, costing 68,000 won for two people. For reservation, call A La Maison at (02) 2223-7100. For those who opting for a musical night out, Sheraton Seoul D Cube City Hotel offers two types of package promotion related to the hit production “Chicago.” This year’s “Chicago” will be played at the D-Cube Arts Center which is connected to the 7th floor of the hotel. The hotel presents a room package and a buffet package, both including two R seat or VIP seat tickets. The room package, with the prices starting at 396,000 won, includes a one-night stay at the hotel. With the buffet package, costing from 171,000 won, guests can enjoy the musical after dining at the Feast buffet restaurant. For more information or reservation, call the hotel at (02) 2211-2100. 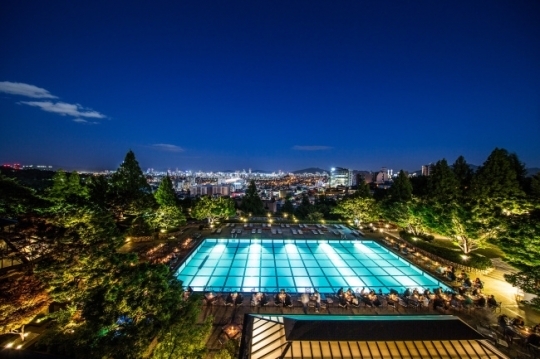 Poolside Barbecue, an outdoor buffet restaurant at Grand Hyatt Seoul Hotel, recently reopened. The restaurant will present a unique gourmet experience, only on summer nights. On the side of the emerald-colored outdoor pool, buffet stations are prepared, filled with varieties of fresh salad, grilled dishes and desserts. Grilled dishes -- from meat, vegetable to seafood -- are immediately cooked upon order over charcoal. An unlimited beverage package, including beer and wine, is offered as well. The buffet restaurant will open every day from 6:30 to 9:30 p.m. Prices for weekdays (from Monday to Thursday) start at 98,000 won and for weekends, at 138,000 won. For more information, contact Poolside Barbeque at (02) 799-8495. Park Hyatt Seoul’s The Lounge presents a variation of bingsu for the upcoming summer season. 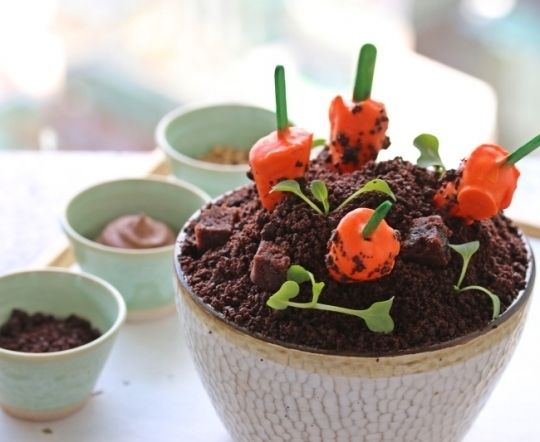 The most highlighted dish on the menu is the new Chocholate Carrot Bingsu, complimented with deep Valrhona chocolate and carrot sorbet. The Lounge’s signature menu Honey Bingsu is presented this year again, layered with ice-milk flakes, honey, apple sauce and chunks of honeycomb. More classic menus, such as Mango Bingsu and Jeju Malcha Bingsu, are on the menu list as well. Bingsoo menus will be on sale until the end of September, with the prices starting at 36,000 won. For more information or reservation, contact The Lounge at (02) 2016-1205.